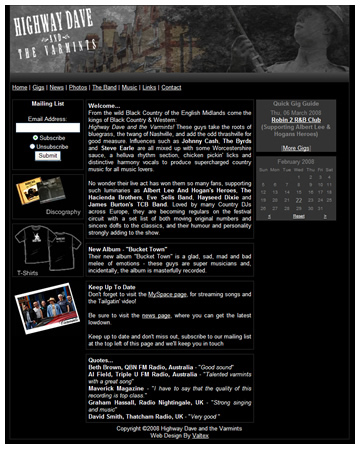 Following the release of the new album Bucket Town, Highway Dave and The Varmints receive a new updated look website to co-incide with the album. Look out for reviews coming soon in Maverick Magazine and Rock n Reel magazine! "Bucket Town" is now available from most online cd stores, such as play.com, HMV, Asda, Tesco and WHSmiths. Don't forget - Highway Dave and the Varmints are going to be supporting Albert Lee & Hogans Heroes at the Robin 2 (Bilston) on the 6th March, So come and show your support! Highway Dave and The Varmints, rebel renegade purveyors of finest Black Country and Western music, will be a’whoopin’ and a’hollerin’ up a storm at the prestigious Robin 2 Club on Friday, 18th May 2007. The band have this month completed work on their new album Bucket Town, slated for release end of June. Bucket Town was recorded and produced by ex-Decca and Stax veteran Dave Williams at his Norfolk based Grange Studios, which specialises in delivering great authentic results for blues and roots artists through the use of top quality analogue tape equipment. While no click tracks, drum machines or cutting and pasting were used in the recording, the album has been mastered for CD using up to the minute digital technology by David Mitson. David, who in a bizarre quirk of fate was at school with Highway Dave and Mick South, has recently returned to the UK after 20 years in Los Angeles, where he was senior engineer for Sony and responsible for mastering many of the world’s most famous artists. Since 2004, Highway Dave and The Varmints have been a firm favourite support for bands like Albert Lee and Hogans Heroes, The Country Joe MacDonald Band, James Burton's TCB Band, Los Pacaminos, Hayseed Dixie, Eve Selis and The Hacienda Brothers, however the 18th May show is their first headliner at the Wolverhampton club and is being filmed for a live DVD later in the year. As a six-piece band, with full drum kit and two percussionists, earning them the title "The Santana of Country! ", Highway Dave and The Varmints deliver a high energy, foot stompin' blend of authentic Americana and Alt Country that's not to be missed. As was overheard at a recent gig, "They are to country what the Pogues are to Irish music". Support will be provided by the wonderfully talented singer/songwriter Eddy Morton with Paul Hodson. Eddy was the founder member of the Bushbury Mountain Daredevils, who over eleven years, 8 albums and many line up and name changes has appeared at every major Folk/Roots Festival in the UK and Europe including Cambridge, Cropredy, Skagen, Guildford, Dranouter and The Badentreffen (Nuremburg). His 2006 solo album The Singing Tree was met with considerable critical acclaim and is available from Proper Distribution. Opening the show will be the seriously cool sound of Mellow Peaches, who simply are good eggs as omelettes go and a must see! 14th April 2007 - The New Album's Recorded! 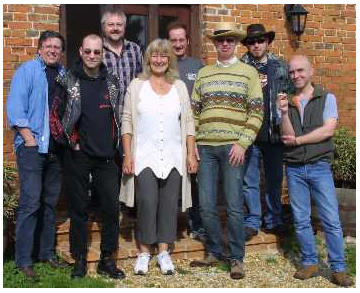 Following a fabulous week with Dave and Sue Williams at their superb Grange Recording Studios in Norfolk, we're very pleased to announce that recording of the new album "Bucket Town" is complete. Thanks Dave and Sue, can't wait for the mix.....! 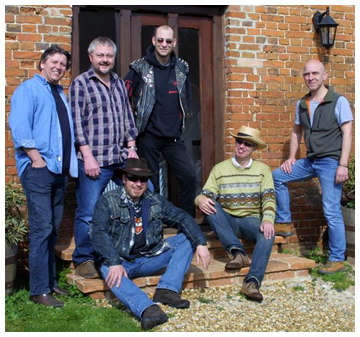 hi-fi+ - "an authentic sounding and high octane alternative country groove"